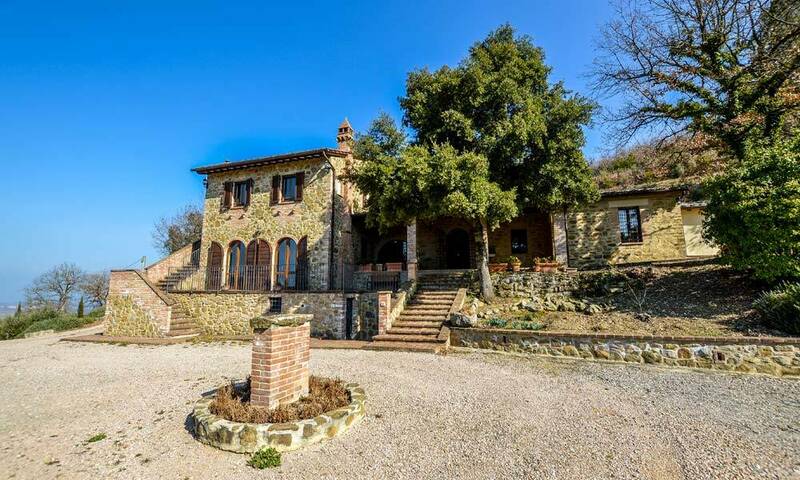 Marvelous country home situated on approximately 1,5 hectares land overlooking the majestic countryside of Tuscany and Umbria and Lake Trasimeno. 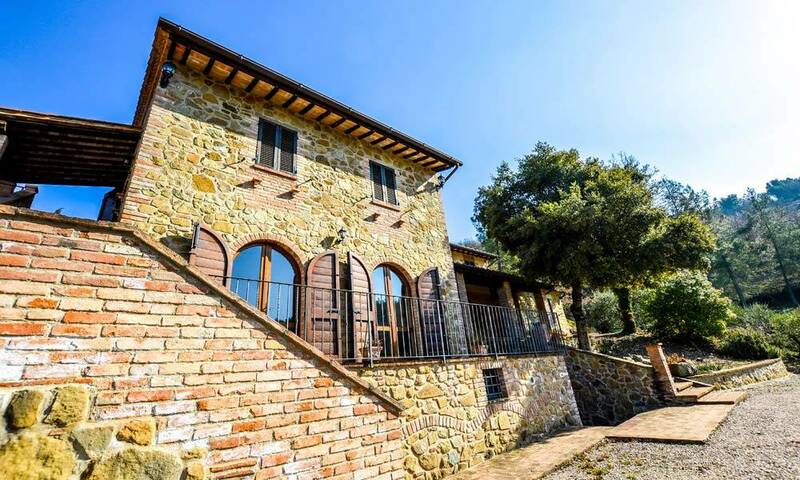 The villa is a beautiful 19th Century country house that was recently restored and renovated from top to bottom by local craftsmen using the highest quality, original materials. 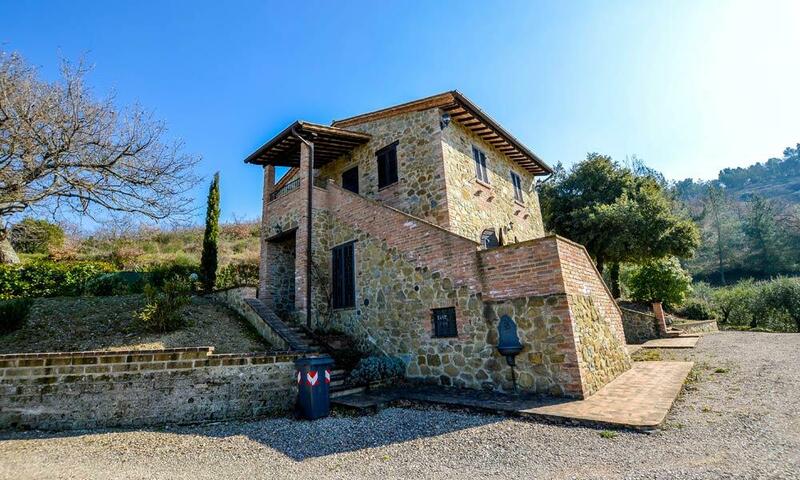 The house is positioned on the hillside outside the charming walled town of Paciano – where international artists have a second home in Italy – which was named by the Italian government as one of Italy’s most beautiful towns. 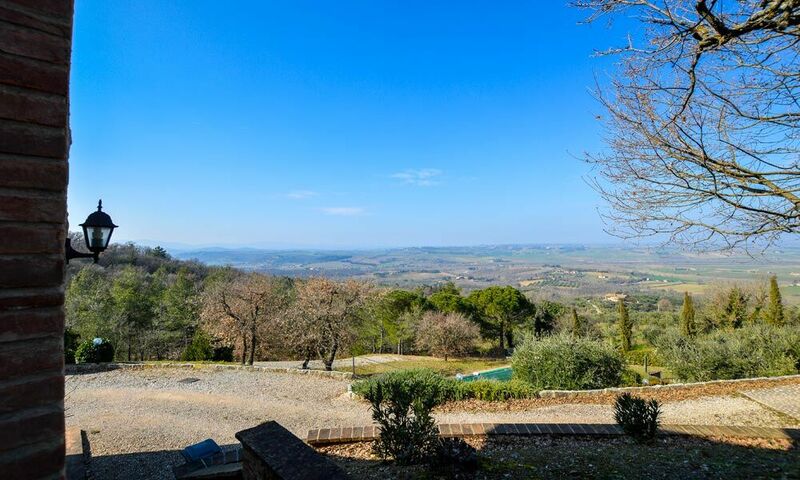 The house and its numerous terraces and patios all have breathtaking views over the Umbrian countryside and Lake Trasimeno, making this one of the most unique and desirable estates in the Italian countryside. 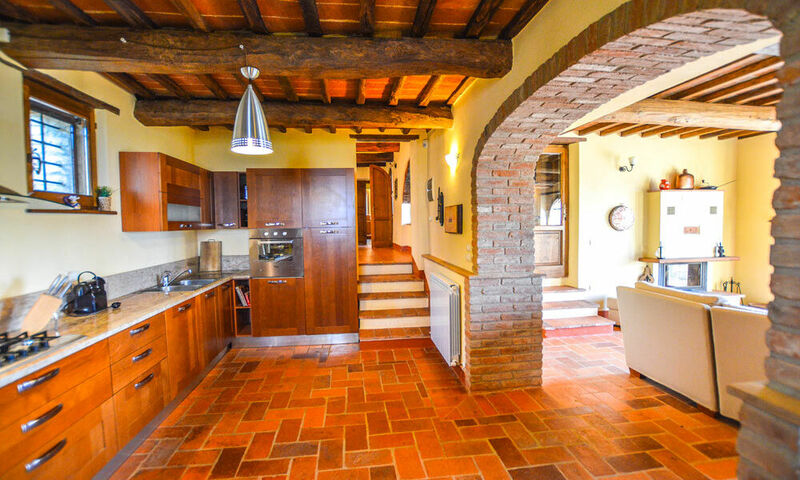 Hall, very spacious living/dining room with fireplace directly connected to the fully equipped kitchen. 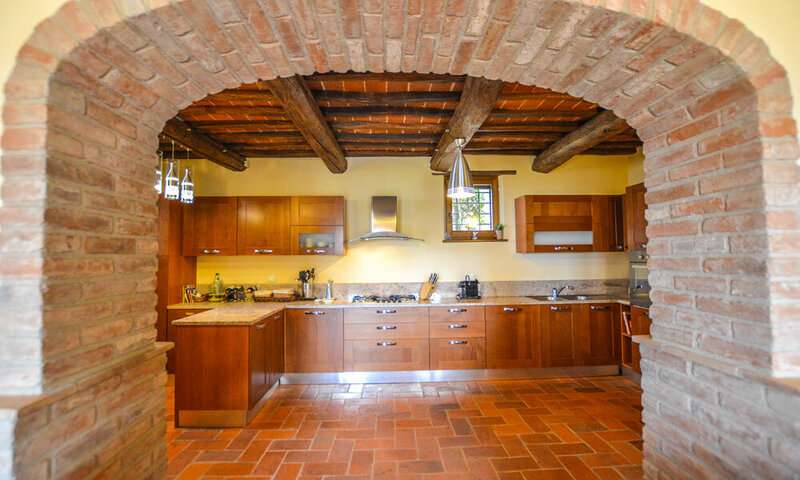 The two rooms are separated by an arch, and this gives a nice sense of depth, while keeping the 2 rooms separated. On this floor there’s also a bedroom, currently used as a studio/living room and includes the house’s second fireplace. 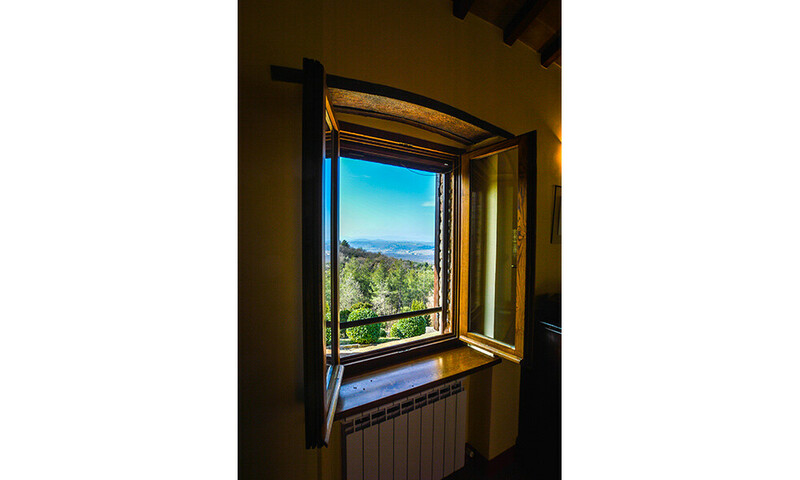 The room also has its own door leading to the front terrace and could be used as a separate guest bedroom. 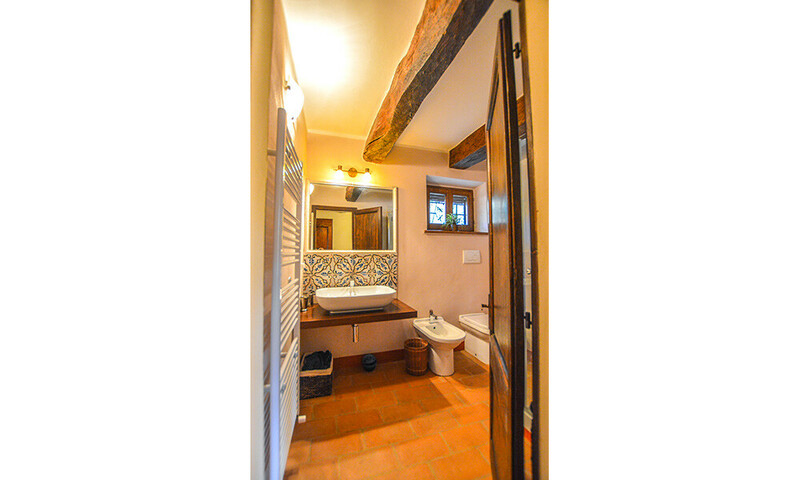 A full bathroom is adjacent to this room. 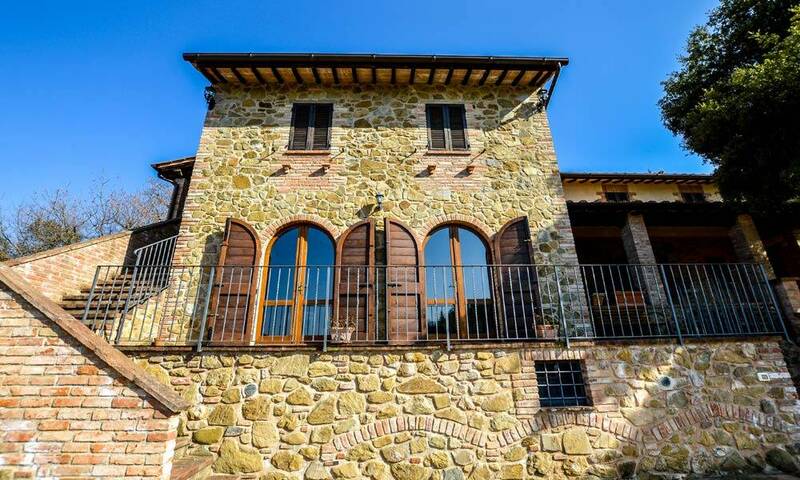 One of the most noteworthy features of this floor is the big number of external areas: a terrace in front of the main façade, another terrace close to the bedroom 2 porticos on the opposite sides of the living room. 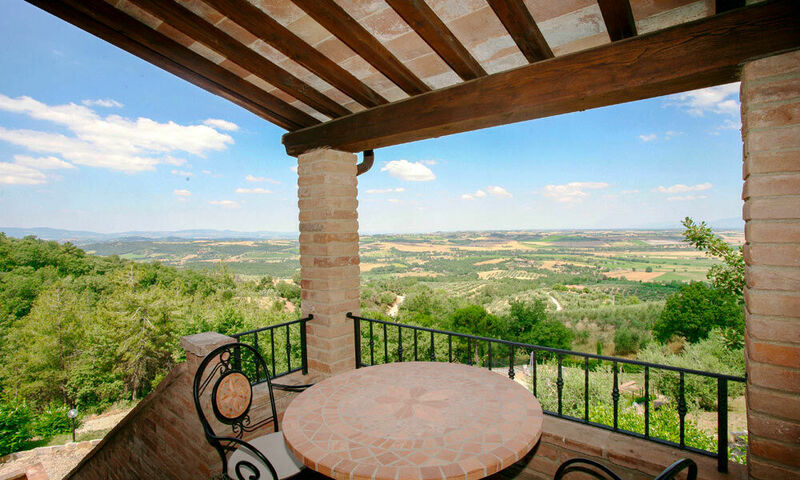 All these semi-covered outdoor spaces have been carefully studied to allow guests to enjoy the outdoors in the shade of the August sun or the autumn breeze. 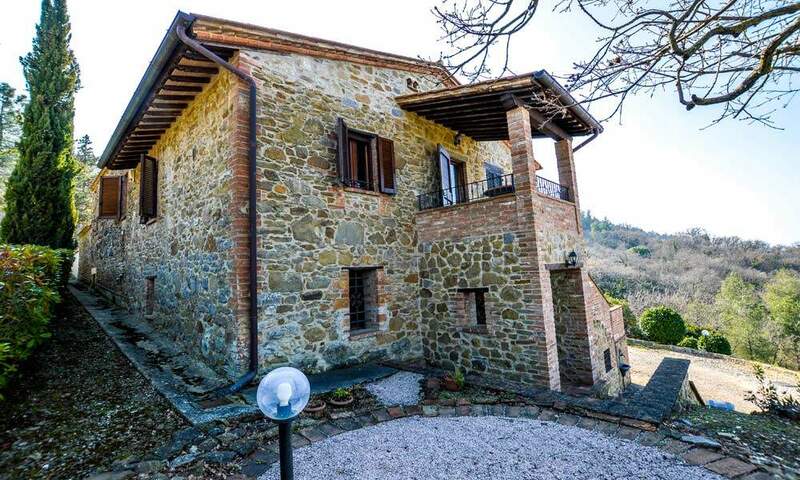 On this floor there is a wonderful master bedroom with striking views of the countryside and a door from the bedroom leads to an external loggia. 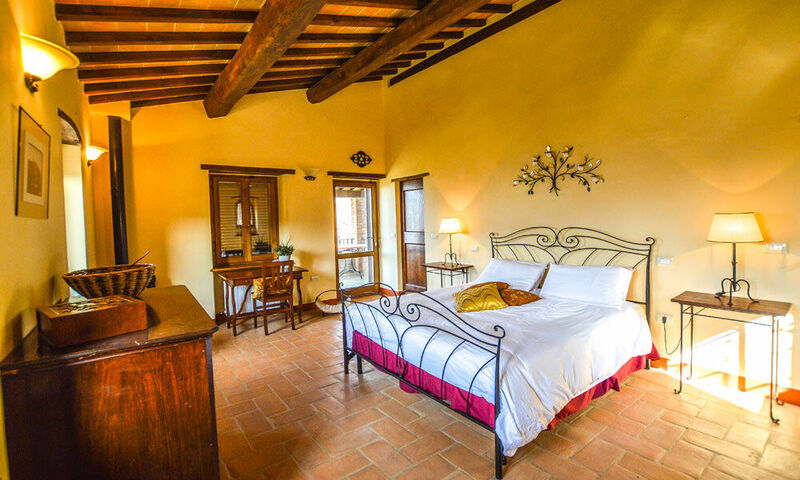 The master bedroom also has its own wood burning stove and an en-suite bathroom with shower and Jacuzzi bathtub. 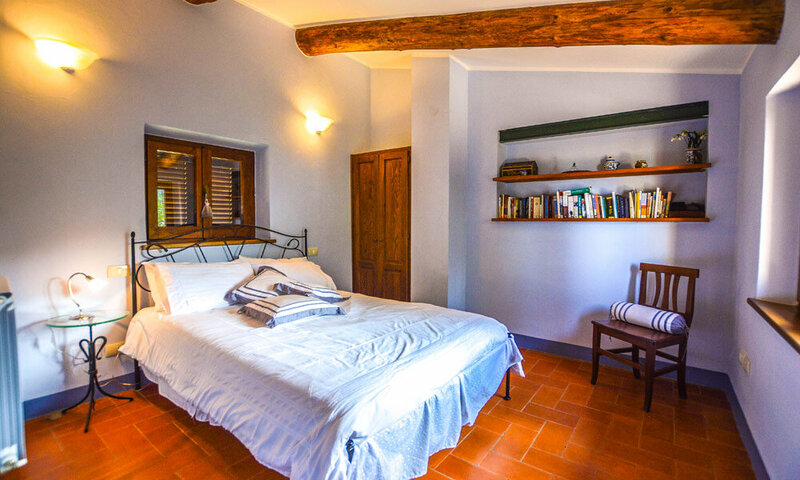 A double bedroom enjoys its own en-suite bathroom with shower, while the guests of the 3rd bedroom can use a bathroom placed along the corridor. 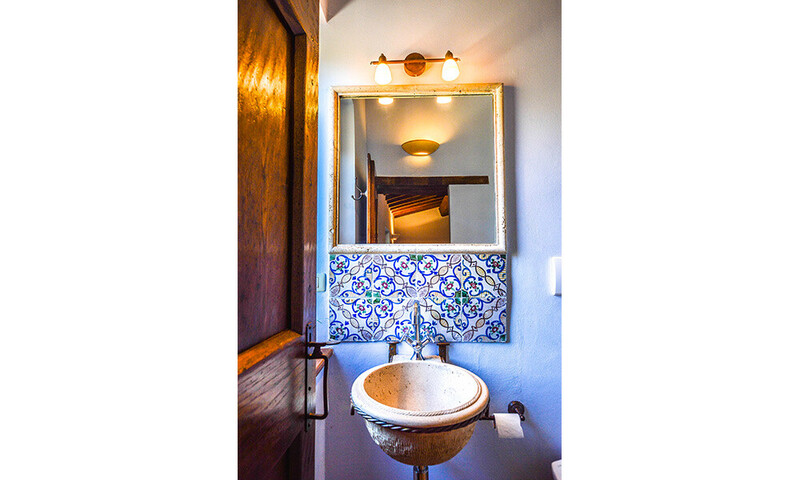 The recently renovated bathrooms were carefully designed using local stone and beautiful antique tiles and accented by stylish modern hardware, including large rainfall showerheads in all bathrooms. 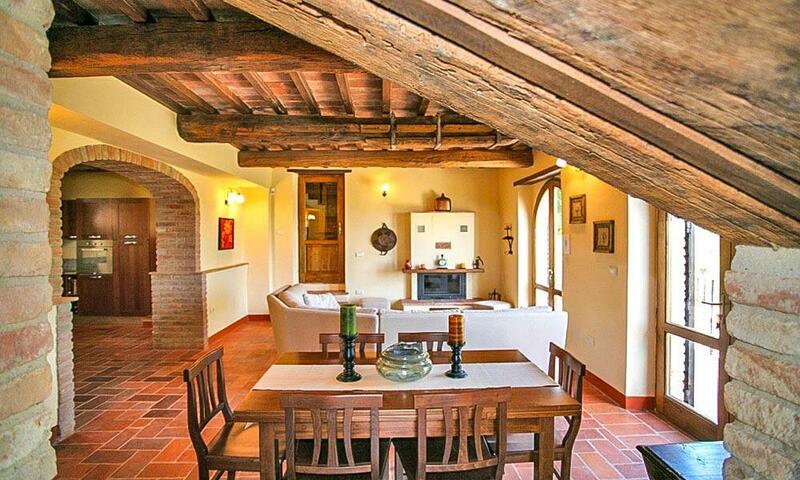 In the renovation of the house they have been very careful to preserve as much as possible the original features. 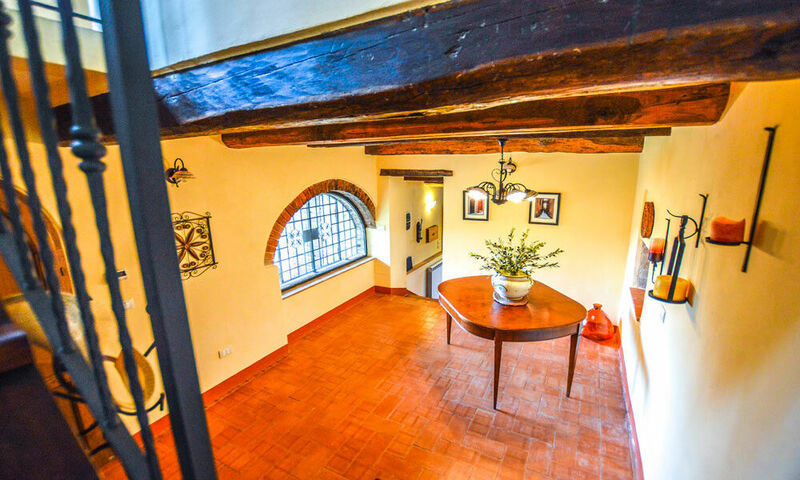 The original terracotta floors, oak beamed ceilings and charming period characteristics are combined with all of the desired modern conveniences, including a large contemporary kitchen, satellite television, an electronic gate and a security system. 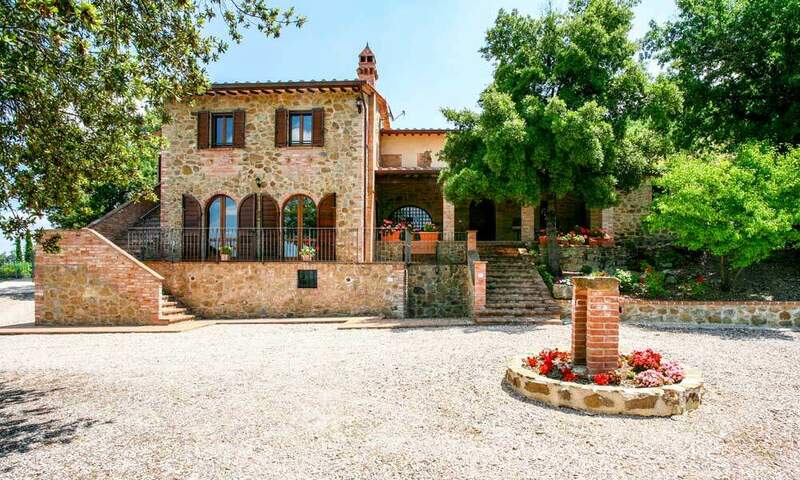 The property sits on a 15.000 sq.m. 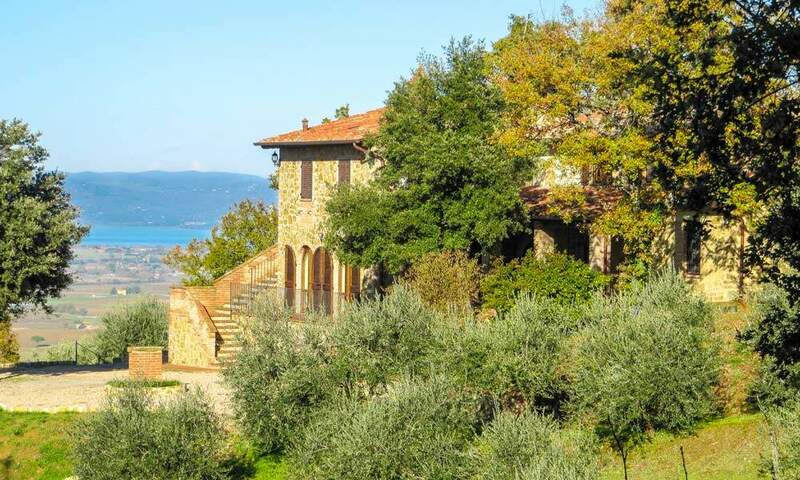 land with olive grove – so you can produce your own olive oil – and other native trees. 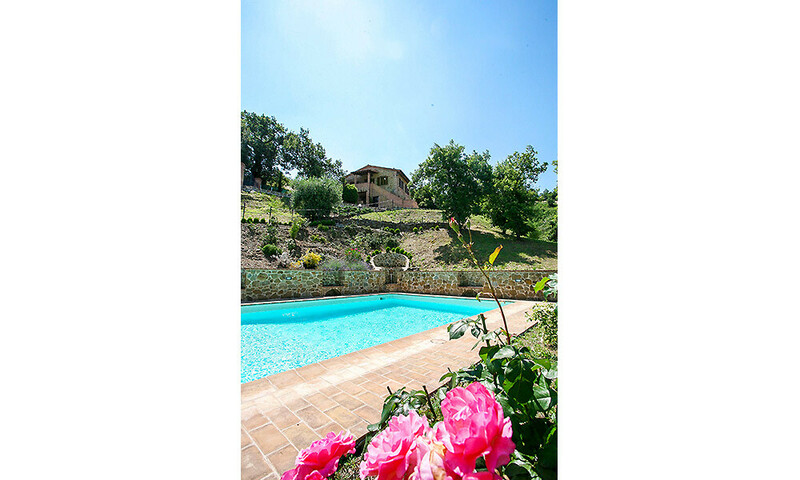 The swimming pool is stuck into the hillside below the house, providing privacy and stunning views. A lighted stone pathway leads you to the pool and the beautifully constructed stone hardscape that surrounds it, which includes a soothing fountain. The pool area has a built-in-solar-heated shower. 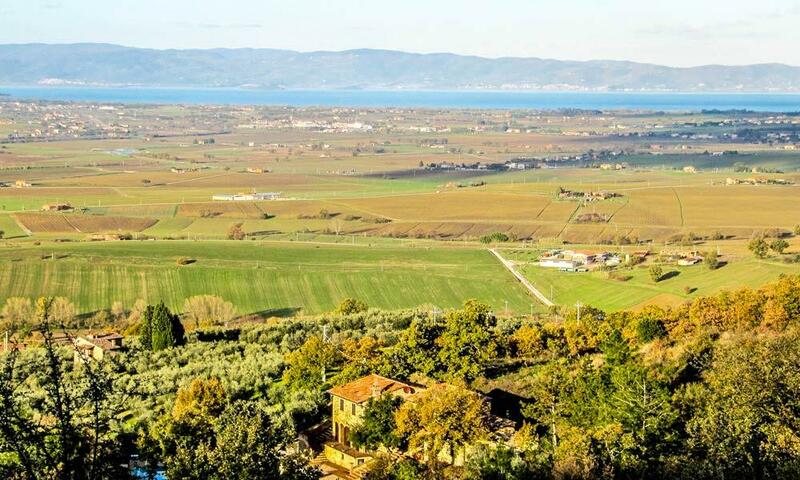 From all corners of the garden you can enjoy beautiful, breathtaking views over the countryside and, if you look north, you’ll see the blue and still waters of Lake Trasimeno stuck in front of you. 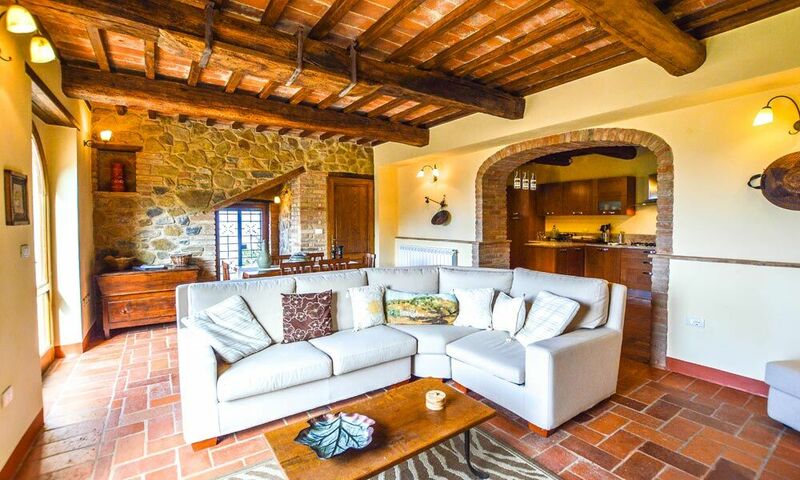 The house’s location provides a quiet, private retreat while being centrally located between Florence and Rome on the Tuscany/Umbria border. 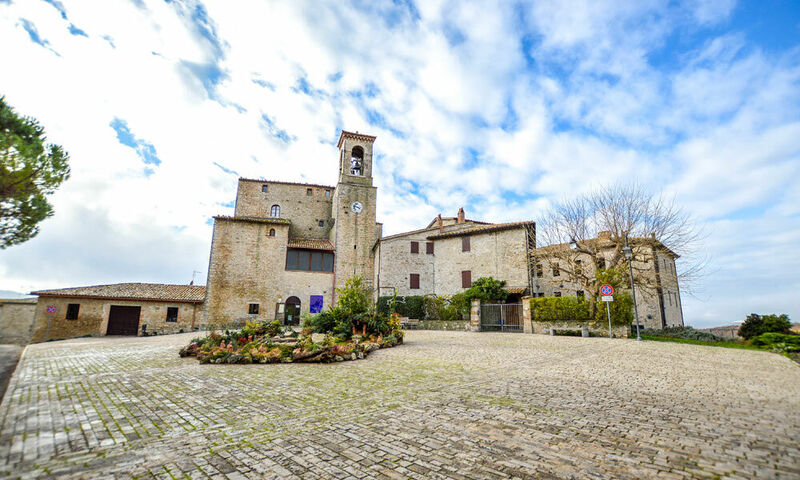 A short drive takes you to many other places of interest including Montepulciano, Cortona, Siena, Perugia and Assisi. 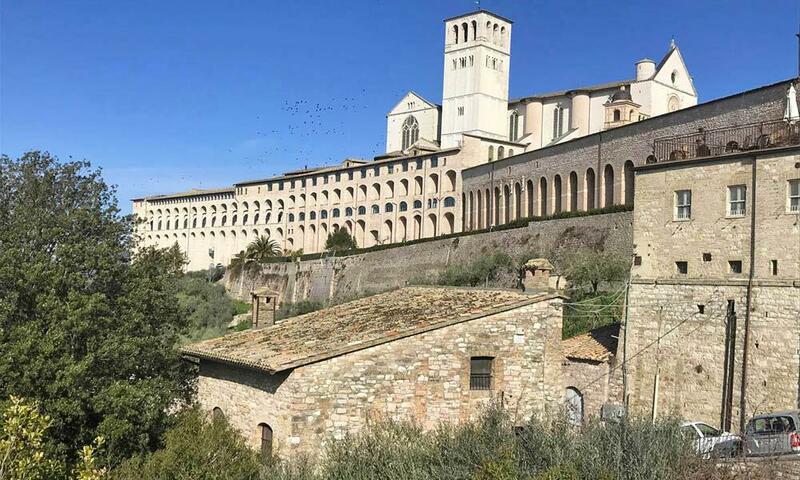 Additionally, the high speed train stops at the local station in Chiusi, allowing arrival in the centre of Florence in 1 hour or Rome in 1.5 hours. 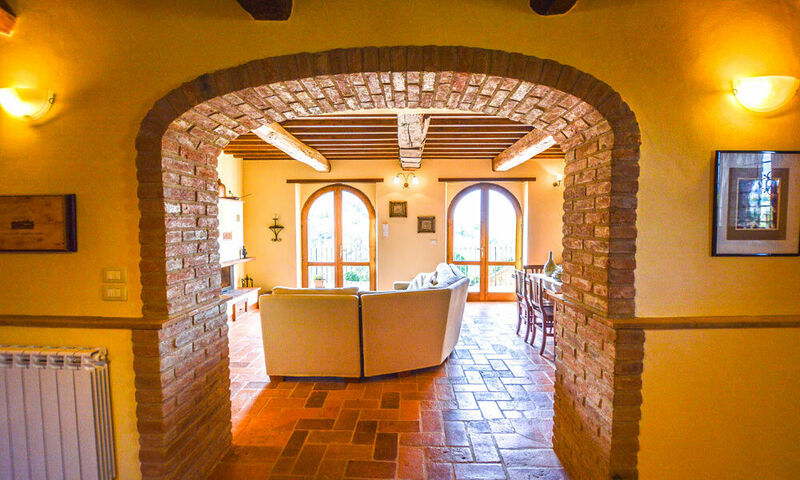 In the last few years, Paciano has been chosen by many artists as the perfect retreat, where they can relax and spend some quality time with their families, while enjoying all the pleasures of La Dolce Vita. 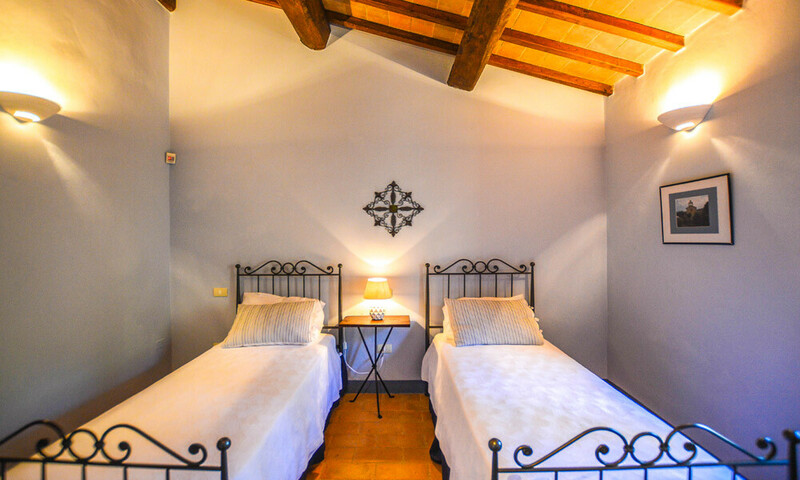 If you are looking for a retreat in Italy, in the tranquility of the countryside but in a posh place, you’ve found it here. 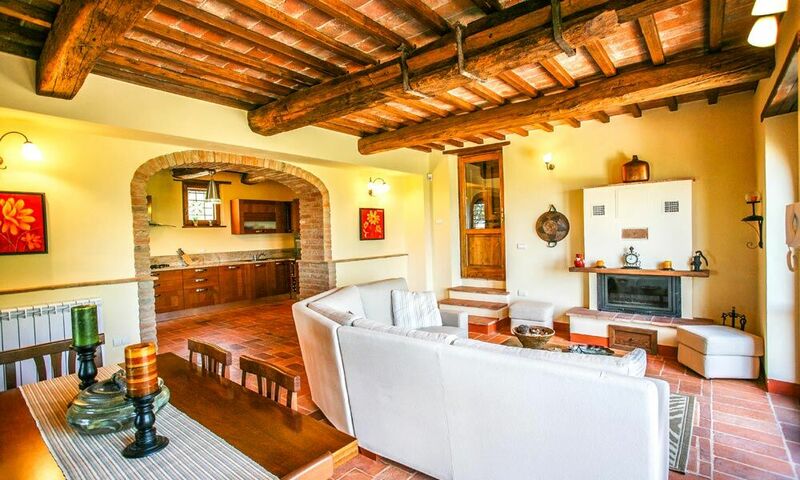 Paciano is one of the most sought for locations in Umbria, thanks to its beautiful landscapes as well as its proximity to Tuscany and the most beautiful towns in Umbria, as Perugia, Assisi and Lake Trasimeno. The house is in excellent condition. 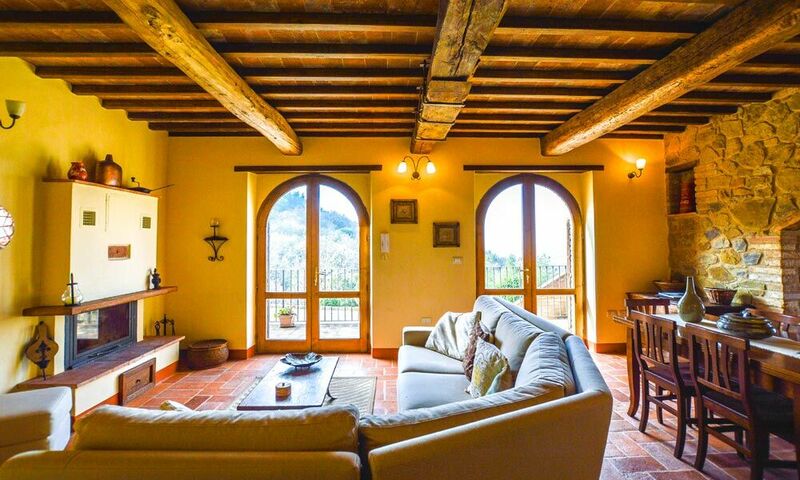 Everything will be very easy, fast and stress-free for you, because once you pick up the keys to the villa, all you have to do is enter it and start enjoying every single moment of serenity and relaxation. 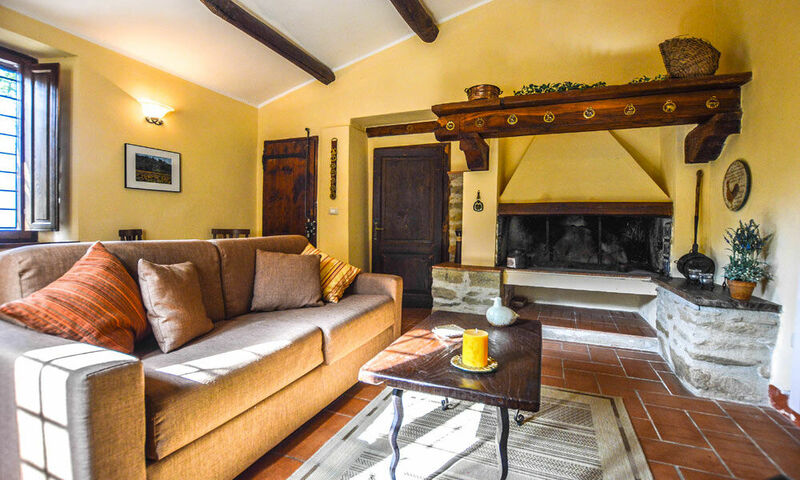 The house offers full space for all your friends and family: the winter will be beautiful, all seated in front of the fireplace to chat. 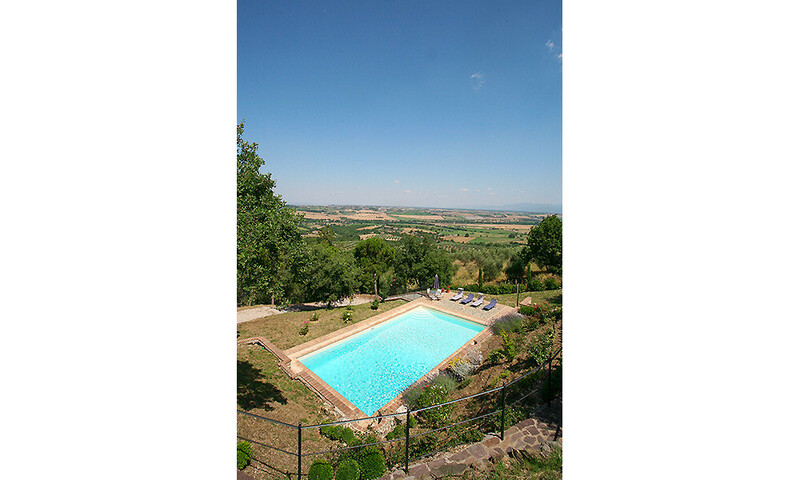 Summer will be even more beautiful, with pool parties organized by the pool and walks in the pristine countryside of Umbria. 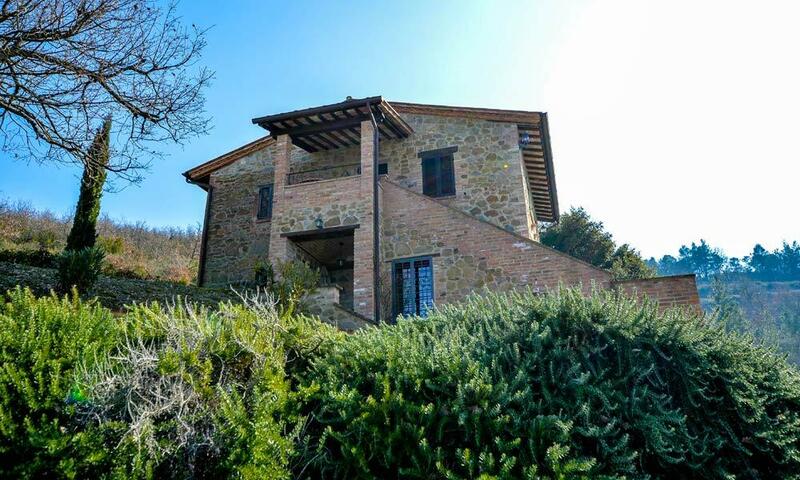 LAND / GARDEN: 15.000 sq.m.